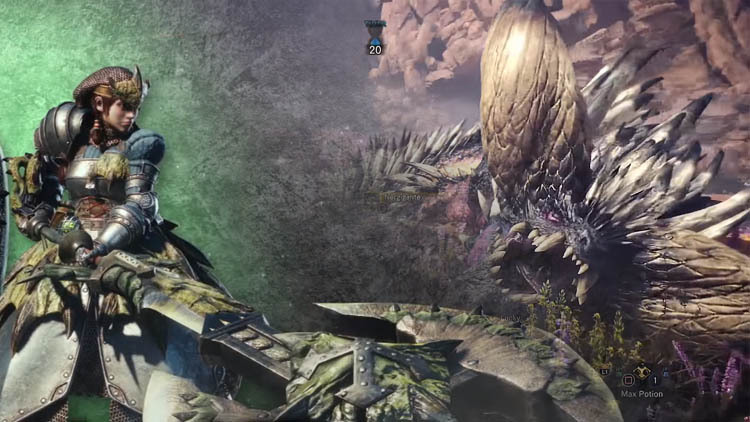 The Charge Blade is a top tier weapon in Monster Hunter World but few players really understand its true potential. 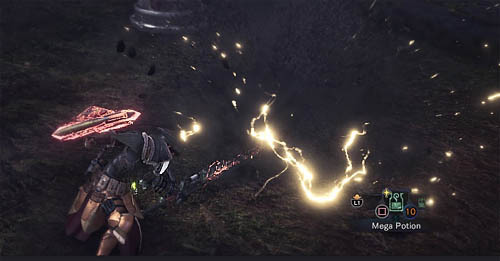 In this guide you'll discover exactly how the Charge Blade works and learn how to use the different Phial super moves including charging the sword and shield. 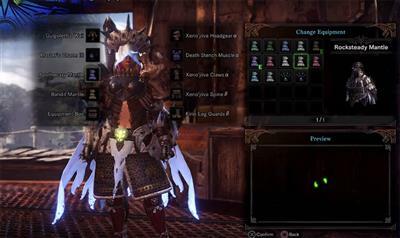 As you should know, the Charge Blade is a combination shield, sword and axe. The shield provides decent defensive protection whilst the sword is great for close range slashing. When morphed together, the sword and shield combine into the slower but larger and more powerful axe weapon. As the name implies, the Charge Blade can be charged with Phials. These must be earned and "banked" into the Phial bottles shown in the top left hand corner of the screen. Yellow and red Phials are typically banked into the solid white Phials, ready to unleash through the Charge Blades amped attacks (super move). New players assume that only the axe has the power to store and unleash the super move (amped attack) but this is not true. Besides the Phial jars in the top corner of the screen are a sword and shield icon. Both of these can also light up, signifying that either or both are charged as well. Understanding this is the real key to the Charge Blades awesome power. Phials (charges) are earned by performing attacks, particularly in the sword and shield mode. The best way to quickly gain Phials is to start with the "Sword: Charged Rising Slash" move by holding down the circle button. You can further chain this attack using more Circle button presses for a dash attack or Triangle for a standing slash attack. Either way, completing a simple combo is usually enough to grant Phials (charges). Once you notice that the sword or bottles are glowing, it's time to "bank" those Phials (charges) for your super move. Once the sword has a glowing colour on its side, or you notice that the Phial bottles are yellow, orange or red, it's time to "bank" those charges for consumption. Remember, if the Phial bottles turn a flashing red colour, your attacks will bounce off so you MUST store those charges. The Phial colours range from yellow, orange and red, with the respective order determining how much of a charge you have built up. Yellow being the least, red the most. The player now has a choice, consume these Phials by morphing into axe mode and unleashing amped attacks. Or, shift these charges into the shield. Choosing to charge the shield puts you one step closer to a much stronger version of the Charge Blade. If done correctly, the player will begin an amped overhead smash but then spin into a sword slice halfway through it. The little sword icon should glow red/pink in the top corner if done correctly. Congratulations you have now transferred the charge to your shield. The shield is now stronger and capable of hurting monsters during a defensive block. Now that the shield is charged, you can optionally charge the sword. First, you must collect more Phials using the standard sword and shield mode, as you normally would to fill the Phial bottles. "Bank" these Phials so the slots turn white and we're ready to go. A glowing sword icon should also appear in the top corner of the screen. When the sword is charged, even simple attacks in sword and shield mode are considerably stronger. 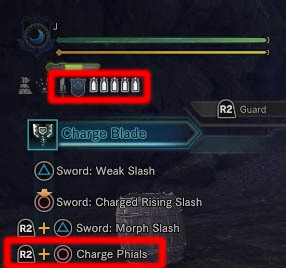 By far the strongest move for the Charge Blade is the Circle button combo during axe mode when all Phial bottles are full and white. Simply switch to axe mode by pressing Triangle and R2 together - this launches an overhead smash. This unleashes a series of long, sweeping axe attacks of high power that end with the slower but highly powerful Amped attack. The sweeping attacks have great circular range, so should a monster move during the attack they're still susceptible to getting hit. If you're skilled enough to time the entire combo then the final Amped attack is enough to bring a monster to its knees in one go! 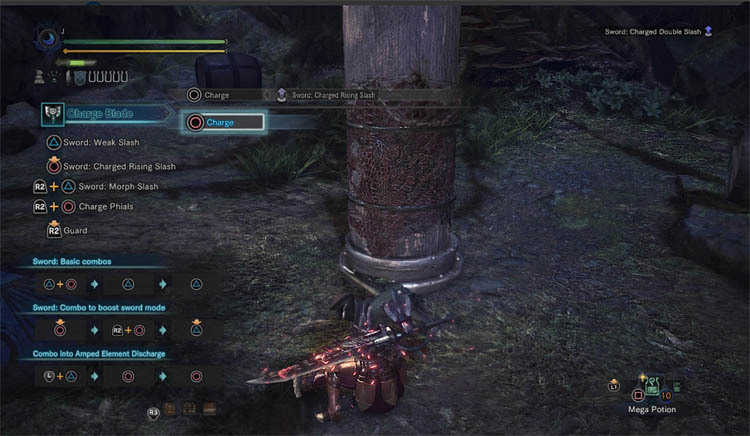 So there we go, hopefully this guide has helped you understand the true power of the Charge Blade in Monster Hunter World!